SELS Registration is open — Have you registered? For the last 14 summers, CASE has convened a group in Washington, D.C., to learn how to make a difference back in our district by talking with the folks up on the Hill! For the last two summers, we have joined forces with CEC to make our footprint even bigger. We were so successful, last summer we had to turn people away due to the size of the hotel we were using. This year we moved to a bigger hotel! We are so excited to be just up the road from where we were last year — same metro stop — at the Westin Alexandria. We will not be turning anyone away this year! We hope to have teams from EVERY state as we gather on Sunday afternoon, July 9 through Wednesday, July 12! Check out the flyer and then head on over to the dedicated website and register! Don't forget to reserve your hotel rooms, too! This summer is going to be a critical year for us to help educate our congressional delegations on our communities, our students, our staff and our needs! Hope to see you in D.C.! Speaking of registering... It is so hard to believe it is almost March and the CEC convention is just around the corner! Have you registered for it yet? If not, now is a great time. Early bird is over now for CEC but you can still get registered! The CEC convention in Boston is going to be amazing and a wonderful place to hear the cutting edge resources you need to take back to your district! And remember, be sure to get to Boston on Tuesday so you can join your fellow CASE members for a wonderful, full breakfast on Wednesday, April 19 just before our annual member meeting. The meeting is always packed with information, opportunities to interact with your colleagues and discuss the major issues of the day! We will also be announcing the new CASE secretary for the 2017-2019 term as well as all the CASE award winners. The meeting is always a great kick off to all the amazing events of the convention ... like the CASE Spotlight session, CASE Night, and other amazing opportunities... CASE Night tickets went on sale February 1 and have been selling at a clipped pace — don't miss out on this amazing night of great food, fun, and excitement at the New England Aquarium. The tickets are just $65 because of the amazing contribution our sponsors are making! Special thanks go to Star Autism, Education Modified, C-8 Sciences and Winsor Learning! You do not want to let this event to sell out so get your tickets today! Check out the CASE Night flyer. You do not want to miss any of the CASE activities at CEC! Not a member of CEC? Why not join now! And speaking of the new CASE secretary... The electronic ballots for CASE secretary went out Monday, Feb. 13 and the election will close Monday, March 6. Every office is an important office but this one is one that requires a great deal of attention to detail and can be grueling during our marathon executive committee and board meetings! According to the CASE constitution, "the Secretary shall keep accurate minutes of all meetings of CASE and of all meetings of the Executive Committee. He/She shall carry on correspondence as necessary in regard to matters delegated by the President and shall elicit, present, and record proposals for establishing or revising the CASE Articles of Incorporation, CASE Constitution and By-Laws, CASE policies, and the CASE Policy Manual. The Secretary shall coordinate, maintain, and disseminate amendments to and an updated copy of the Articles of Incorporation and CASE Constitution and By-Laws. The Secretary shall have the option of appointing Ad Hoc committees as needed to fulfill these responsibilities." If you were a member of CEC/CASE on Feb. 7 then you should have received your ballot in your email Monday evening, Feb. 13. There are two candidates — Jenifer Cline (MT) and Butch Stevens (MS) for the one office. It will not take you long to read their bios and view their campaign flyers. Please take a few moments to check out this information and vote. If you cannot find your ballot and you believe you are a member of CASE/CEC, contact me as soon as possible so we can check on the reason you didn’t get a ballot. We had an amazing two days at the CASE Hybrid! Missed it? You can still purchase the DVD and then you can use it to share these amazing sessions with whomever whenever! Just go to register and select DVD. It will be mailed to you in about 6-8 weeks after the event and then you can show it one section at a time throughout the year; check it out to individuals; or show it all in tact! It is yours to use as often and with whomever you wish! The question last week was "what is essential information for general education teachers to know..." First place at 54 percent was how to differentiate instruction. At a very distant second place 15 percent was a tie between classroom management and behavior support skills and various components of an IEP. Third place was a tie at 8 percent between how to provide accommodations/modifications and unspecified other. 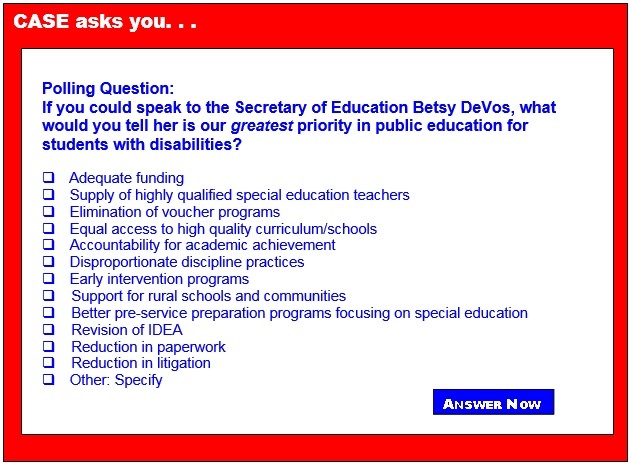 It is obvious our members believe general education teachers need to be well versed in special education. What are we doing to help our colleagues obtain these necessary skills? Help us help you! Let us hear from you on what we can do to assist you. We believe the Great Instruction, Great Achievement book is one amazing tool to help you with your day to day job. Give us other suggestions! Thank you again for all you do EVERY day for your district, your students, your staff and your community! As school dropout rates have been correlated with a host of detrimental student outcomes, numerous efforts have been made in research to understand the variables that are contributing to dropout. While there are a number of factors, researchers have worked to identify warning signs of student disengagement, and ultimately, school dropout. These variables are now termed the A-B-C's of school dropout: attendance, behavior, and course performance. With a clearer description of these variables, researchers have developed tools to track and monitor student progress in each of these areas, as well as flagging those students at-risk for dropping out. This systematic screening process provides school administrators with the ability to keep an eye on all students and provide supports tailored to the area of their needs. Ultimately, screening for dropout aims to prevent students from "flying under the radar," catching these warning signs early enough for intervention and remediation. "Preschoolers don't just learn in inclusive settings, they thrive!"